All the Pretty Little Horses · All Through the Night · The Ash Grove · Black Is the Color of My True Love's Hair · The Blue Tail Fly · Bury Me Not on the Lone Prairie · Clementine · The Cruel War Is Raging · Danny Boy · Deep River · Down by the Salley Gardens · The Erie Canal · Git Along, Little Dogies · Go, Tell It on the Mountain · Home on the Range · The House of the Rising Sun · How Can I Keep from Singing? · Hush, Little Baby · Jacob's Ladder · John Henry · Kumbaya · Lonesome Valley · Michael Row the Boat Ashore · The Old Chisolm Trail · Shall We Gather at the River · Shenandoah · Simple Gifts · The Streets of Laredo · Swing Low, Sweet Chariot · When Johnny Comes Marching Home · Yankee Doodle · and many more! The Fake Book of the World's Favorite Songs - 4th Edition is a must-own collection of more than 735 songs arranged with melody line, lyrics and guitar chord frames. It features a wide variety of songs, including singalongs, Christmas songs, classical themes, marches and patriotic songs, polkas, inspirational and sacred tunes, international folksongs, and many more. This latest edition has been updated to include even more favorites. A-Tisket A-Tasket * Abide with Me * After You've Gone * Air on the G String * Alexander's Ragtime Band * Aloha Oe * Alphabet Song * America the Beautiful * Anchors Aweigh * Angels We Have Heard on High * Arkansas Traveler * Au Clair De La Lune * Auld Lang Syne * Battle Hymn of the Republic * Beautiful Dreamer * Bill Bailey, Won't You Please Come Home * Blue Danube Waltz * Bury Me Not on the Lone Prairie * Chopsticks * (Oh, My Darling) Clementine * Down in the Valley * Faith of Our Fathers * Fur Elise * God Rest Ye Merry, Gentlemen * His Eye Is on the Sparrow * I Wonder Who's Kissing Her Now * Jesu, Joy of Man's Desiring * Kum Ba Yah * My Old Kentucky Home * Sidewalks of New York * Take Me Out to the Ball Game * When Johnny Comes Marching Home * When the Saints Go Marching In * and hundreds more! Over 500 Latin songs in many styles for all C Instruments, including mambos, sambas, cha cha chás, bossa novas, boleros, guarachas, rhumbas, tangos, salsa, Latin jazz, Latin pop and rock, and traditional Latin standards. 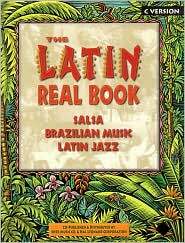 This professional-level Latin fake book features nearly 600 pages of the best in contemporary and classic salsa, Latin jazz and Brazilian music, with detailed arrangements, exactly as recorded, to help bands play in authentic Latin styles. Many tunes include bass lines for each section, piano montunos, and horn counter-lines. Includes a bilingual preface, song lyrics in Spanish, Portuguese and/or English, a drum and percussion appendix, and convenient spiral binding. Outstanding artists represented include: Ray Barretto, Eddie Palmieri, Ruben Blades, Puerto Rico All-Stars, Tito Puente, Irakere, Los Van Van, Ivan Lins, Tom Jobim, Joao Bosco, Milton Nascimento, Airto, Mario Bauza, Dizzy Gillespie, Daniel Ponce, Seis Del Solar, Chick Corea, Arsenio Rodriguez, Celia Cruz, Perez Prado, Orquesta Sensacion, and many more! Across the Western Ocean * Along with My Love I'll Go * Altar Isle O' the Sea * Auld Lang Syne * Avondale * The Band Played On * Barbara Allen * Blessing of the Road * The Blue Bells of Scotland * The Bonniest Lass * A Bunch of Thyme * The Chanty That Beguiled the Witch * Columbus Was an Irishman * Danny Boy * Duffy's Blunders * Erin! Oh Erin! * Father Murphy * Finnegan's Wake * The Galway Piper * The Girl I Left Behind Me * Has Anybody Here Seen Kelly * I Know Where I'm Goin' * Irish Rover * Loch Lomond * Molly Malone * My Bonnie Lies Over the Ocean * My Wild Irish Rose * The Shores of Amerikay * The Sons of Liberty * That's an Irish Lullaby * When Irish Eyes Are Smiling * Who Threw the Overalls in Mistress Murphy's Chowder * and hundreds more.